What is Posmeal MD (Voglibose) used for? 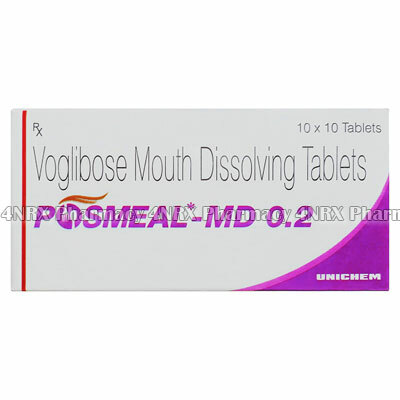 Posmeal MD (Voglibose) is an oral hypoglycemic medication, belonging to the class of competitive alpha glucosidase inhibitors. Alpha glucosidase enzymes are involved in breaking down complex carbohydrates, such as disaccharides, oligosaccharides, and polysaccharides. The medication inhibits alpha glucosidase enzymes, slowing down the processes of complex carbohydrates breakdown and glucose absorption. Subsequently, the blood glucose level after a meal decreases. Posmeal MD (Voglibose) does not affect beta glucosidase enzymes. Posmeal MD (Voglibose) is slowly absorbed, quickly metabolized and then eliminated from body via intestines. Blood and urine do not contain any Posmeal MD (Voglibose) metabolites. Posmeal MD (Voglibose) is prescribed for type 2 diabetes (monotherapy or combination therapy with other hypoglycemic medications or insulin); for type 1 diabetes (combination therapy with insulin); and for type 2 diabetes prevention. How should I use Posmeal MD (Voglibose)? Posmeal MD (Voglibose) has to be taken right before the meal. Normally, healthcare practitioners try to avoid any adverse events and prescribe to most patients the initial dose of one 0.2mg tablet taken three times daily. It is important to note that the dose may be subsequently raised to 0.3mg taken three times daily if the initial dose was not sufficient to achieve the required therapeutic effects. What are the side effects of Posmeal MD (Voglibose)? Side effects are the part of the pharmacological action of the medication along with its therapeutic effects. To minimize side effects, your physician may reduce the dose, change the dosing frequency, or replace the medication with another one. Certainly, the medication as well as its safe dose are prescribed by the doctor, however the final decision on whether to take the medication or not remains with the patient. Anti-diabetic drugs: sulfanilamides and sulfonylureas derivatives, biguanides derivatives, insulin preparations and medications improving insulin resistance (due to hypoglycemia risk). Medications that increase the hypoglycemic effect of anti-diabetic drugs (such as beta-blockers, salicylic acid preparations, monoaminooxidase inhibitor, fibrate derivatives to treat hyperlipidemia, warfarin, and others). Medications that decrease the hypoglycemic effect of anti-diabetic drugs (such as adrenaline, adrenal hormone, thyroid hormone, and others).